New, bigger&better scans of the same comic (except text & non-house ads) uploaded 5¼ years ago. Also now with HAG fc+bc. Credits: Pencils: Joe Doolin | Inks: Joe Doolin ? Synopsis: Ann is taken by slavers. Kaänga and N'geeso pursue and rescue her. 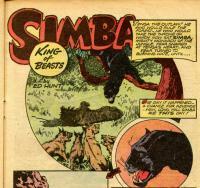 Synopsis: Tenga, with the assistance of a pack of hyenas, challenges Simba for the kingship of the forest. Simba meets the challenge and drives Tenga away. 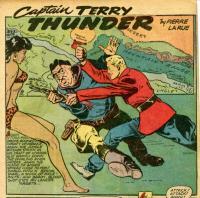 Synopsis: Terry, with the help of Tinga, the N'Togo priestess, and Keeto, puts an end to the depredations of the treasure hunter Brannigan. Synopsis: A brief description of some of the animals that inhabit the Indian jungles. 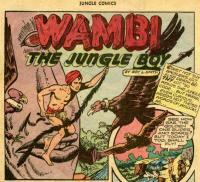 Synopsis: Wambi returns a sacred gem to its place in a mountain idol. 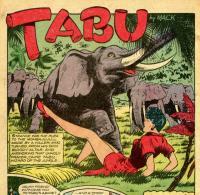 Comic Story (6 pages) "Strange was the plea to the momba juju --"
Synopsis: When treasure hunters steal a tribe's idol, Tabu pursues the thieves and secures the sacred object. Synopsis: Brief natural histories of the rhinoceros, the cheetah, and the hyena. Synopsis: Demo plots to steal the T'bongas sacred jewels. Camilla foils his schemes.